Betty Sue is going to New Zealand for six weeks this summer. Billy Bob is going to Chile. Janie flies to Saas Fe for two weeks. Johnny is hanging out in Whistler for two back-to-back sessions. Jenny’s got her bag packed for three weeks in Mt. Hood. And these kids are J4’s. Sure they are fictional, but substitute their names for Ashley, Kendall, Steve, Max, or other "nineties favorite" and you’ve got a picture of where ski racing is headed. But does all this time on snow really help? Experts agree that some summer time on snow is helpful for young racers. How much is debatable. Six weeks for a J4 is certainly too much. Burnout is on the horizon, and well, shouldn’t kids spend time being kids? How you approach summer ski racing camp is determined by who your child is. Are they tentative about ski racing? Are they more interested in the social aspects, the fun? Do they study videos on technique and emulate style? Do they “Google” every camp on the Internet and regurgitate findings at every opportunity? Do you “Google” every camp on the Internet? The first order of business is to determine, "Who is driving the bus?" If your child is pushing for the ski camp experience, then they may be ready for a more intense ski training experience. If your child has not broached the subject, but you think it will help their skiing, then a more “camp” or fun experience that includes skiing may work best for your child. Have a very tentative child? Consider a "family" camp where parents are welcome to interact with campers, making it more of a family vacation, than a dedicated ski racing camp. Where? Basically your choices break down to two categories: Northern or Southern hemisphere. Northern hemisphere means summer snow. Summer snow can be a great training experience. Usually days start very early and end a little after noon. Courses are salted, and quite firm, slowly moving to soft snow. Mt. Hood, Whistler, and European glaciers offer summer snow. Southern hemisphere ski race training involves travel – a lot of it. The main destinations are New Zealand and Chile, but some camps head to Australia and Argentina as well. Southern hemisphere ski race training involves winter snow – with training going full days. Along with that winter snow comes winter weather. Storms can often hinder race training – but do offer campers a chance to free ski powder (who doesn’t like that?). Which camp? Choosing a camp can be difficult. Once you determine your destination (above), the choice of a camp comes down to which camp offers your racer the best experience for their level of skiing as well as their commitment to the sport (see above). 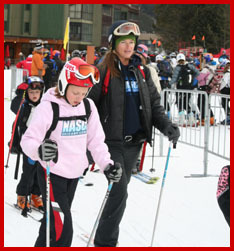 Many ski teams offer off season ski training camps. Should you go with your existing program or venture off to another camp with different coaches? As with most subjects surrounding ski racing, there are two sides to the equation. Staying with the same program offers continuity with a guaranteed social environment. If your child is progressing and you are happy with the results, the “if it ain’t broke, don’t fix it” approach may be best. But if your child has been struggling with the same issues throughout the season, a new coach may shed light on the problem. Or perhaps your child is in need of some special attention, new friends, new activities or just a new adventure. Then you should look for a camp that provides what you have determined your child needs (again, look above). Choosing the right camp is tough. Your child will get pressure from all directions. From friends, to time, to financial decisions, the choice is not easy. One of the most important things to keep in mind is to make the best decision for "your" child. A very wise coach, Guenther Birgmann of Treble Cone Race Academy and Sugar Bowl Ski Team, had this discussion with my son. "Stop worrying about what everyone else is doing. Do what is best for you. Concentrate on what you need." This advice ultimately rings true whatever your direction is in life. It’s tough love for a teen who wants to be where the action is with friends. Money. Ski racing is not cheap ("duh" – you say). Sending your child to camp for even a one week session can set you back. It’s important to evaluate the benefit for your child. Certainly a stint at any sleep-away camp is time and money well spent. It offers your child a sense of independence and worldliness. If your child plans to do any serious ski racing, traveling without parents is a prerequisite. Some camps come with fancy food and high quality linens. Some offer a bunk and a burger. Think about the ramifications of going too big, too early. What will your child have to look forward to if you send them to a five star camp at age 10? They may not even continue skiing if it means bunking in with other kids at a race event. Start low, aim high. When to go. The "when" will depend on the "where". Summer camps in North America are best visited in early summer, but it does depend on snow coverage. Mt. Hood has had a few big winters that make summer training run straight through September. For southern hemisphere destinations, late July into August and September are best. Glacier skiing is good all summer long. Many camps schedule sessions in October to get racers ready for the season. More camps are offering early season training in November on early winter snow. Copper Mountain, CO, is racer central in November. Don’t be afraid to ask a lot of questions. Many commercial camps have very informative websites including videos that show camp accommodations, activities, even airport pickup. Be clear on your goals for camp. Do you just want your child to have fun? Do you want her to conquer cross blocking? Break in new equipment? Sit down with your child and discuss the mission. Then have that same discussion with the camp director. Upon return, evaluate the experience. Most camps will provide you with a camp report on practiced skills, accomplishments, and give tips on what needs to be worked on. If the camp does not provide it, don’t be afraid to ask for feedback. If you are not getting information, then the camp may not be serious about satisfying your goals. For more on summer ski camps see our camp listing here.